roberto ferri is born artistically when he joins the team pdu for which realizes four 45 .
accounts for the ariston if by chance the illness.. an album on diversity that has become a cult for collectors. he writes songs for other artists including dori ghezzi,iva zanicchi,giorgia,toto cutugno,cristiano de andré. in 1983 he wins, as author, the festival of saint remo, with what will be sung by tiziana rivale. roberto ferri follows courses of theatre, pantomime, variety, comedy directed by antonio fava pupil of jacques lecoq. is born at that time a deep friendship with fabrizio de andré which cooperates with (dog face, more beautiful than i…) and wich asks tips to. the french-italian association in bologna involves roberto ferri on the task of remembering the tenth anniversary of the death of brassens with concerts including his french songs. moreover the famous singer mina had heard Roberto ,in the bohème of aznavour, at the festival of castrocaro and recruited him. roberto ferri back in the limelight with a repertoire of french songs doc signed brel, aznavour, piaf, ferré, bécaud, brassens,vian. in 1997 with and tell me you do not want to die, written with vasco rossi, gaetano curreri and ferri too,scopes to successfully patty pravo,that jumps hit parade getting a good success with the public and selling. 1999 is his song women lengthening life interpreted by fausto leali and teo teocoli. sarah brightman sings piano, memory in english, taken from the musical cats by andrew lloyd webber (more information available on this page). 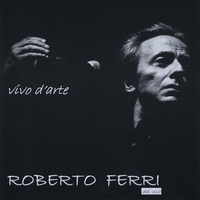 in the summer of 2000 roberto ferri performs at the fano’s festival "the violin and the flint" by the artistic direction of franco battiato. in the same summer performs as supporter in banda orchestrale ,the show that franco battiato carries around for italy, and in the following season. he participates at the festival international music in salerno, opening the concert of juliette gréco. in genova at the memorial dedicated to fabrizio de andré, ferri is invited to contribute with the major italian songwriters (celentano, rossi, battiato,sugar, mannoia, jovanotti, vanoni)presenting the romance of marinelle in french version, song that translates and sings. realizes cd of songs, french classics and of italian contemporary songwriters (de andré, battiato, rossi), which translates and sings in french language. october, november and december 2001 is engaged in a tour of shows, organized by french cultural associations for the defence of language, france, belgium, canada, switzerland and atlantic islands. proposes songs of french authors in language and original italian songs in french. in 2002 participates in conferences at san remo premium tenco about lirycs translation. involved in the 2003 at fano’s festival, evening dedicated to chansonniers. in the autumn of that year, the foundation de andré publishes de andré live cd of memorial, “faber fragile friend”. ferri there interprets the romance of marinelle, its french version of the famous song of fabrizio de andré. months pass and roberto port around for italy his concert and provides a continuous renewal. it is accompanied by his jazz trio led by alessandro altarocca. he’s on the market with marinelle et le chat and, more recently, with if by chance the illness… both recorded live. other artists sing his songs: celentano with lunfardia, morandi with life teaches us to live.. and burns the heart,alexia sings as you want me, from broadcasting friends..federico and giulia sing as nice to have 20 years. soon ferri will come out with a new live cd and a project with other important and interesting artists.